Sundance Institute today announced the Fellows and Advisors slated for the annual weeklong Creative Producing Labs, which commence July 30 at Sundance Mountain Resort in Utah, as well as the industry leaders and other independent filmmakers who will gather for the three-day Creative Producing Summit immediately following. Created to champion and develop the current and rising generations of producers, the Institute’s Creative Producing Program nurtures creative vision and holistic best practices at every stage of a film’s progress from development to audience engagement. The program, which recognizes the need for a flexible, robust support system and community in an evolving industry, includes the annual Labs and Summit as well as year-round mentorship, granting, education and opportunities for financing and distribution. The Institute’s annual Producers Awards, supported by Amazon Studios, recognize both Fiction and Nonfiction producers at the Sundance Film Festival’s Producers Lunch. Creative Advisors for the Feature Film Program include producers Anthony Bregman (Eternal Sunshine of the Spotless Mind, The Savages), Jess Calder (Blindspotting, Anomalisa), Keith Calder(Blindspotting, Anomalisa), Paul Mezey (Beasts of the Southern Wild, Maria Full of Grace), Heather Rae (Frozen River, Tallulah) and Adele Romanski (Moonlight, The Myth of the American Sleepover). Advisors also include screenwriter Meg LeFauve (Inside Out, The Good Dinosaur) and screenwriter/director Jeremiah Zagar (We the Animals, In a Dream). Producing Advisors for the Documentary Film Program include Joslyn Barnes (Hale County, This Morning, This Evening; Strong Island; Zama),Jessica Devaney (The Feeling of Being Watched; Call Her Ganda; Speed Sisters), Andrea Meditch (The Cage Fighter; Buck; Man on Wire) and Bob Moore (Anote’s Ark, Tokyo Idols, Last Train Home). Panelists for the Creative Producing Summit include Rebecca Arzoian,Focus Features; Jon Bardin, Discovery Channel | Science Channel; Glen Basner, Film Nation; Dori Begley, Magnolia Pictures; Jason Michael Berman, Mandalay Pictures; Ian Bricke, Netflix; Effie Brown, Duly Noted; Mandy Chang, BBC Storyville; Adam Del Deo,Netflix; Alan Eyres, National Geographic; Elissa Federoff, NEON; Scott Foundas, Amazon Studios; Taylor Friedman, Fox Searchlight; Julie Goldman, Motto Pictures; Kevin Iwashina, Endeavor Content; Sara Kiener, Cinereach; Laura Kim, Participant Media; Jessica Lacy, ICM; Vinnie Malhotra, Showtime Networks; Deb McIntosh, Endeavor Content; Cara Mertes, JustFilms at Ford Foundation; Justine Nagan, American Documentary | POV; Lesley A. Norman, WNET New York Public Media; Maren Olson, Creative Artists Agency; Adam Pincus, Topic Studios/First Look Media; Rose Catherine Pinkney, BET; Annie Roney, ro*co films; Kim Roth, MACRO; Courtney Sexton, CNN Films; Tristen Tuckfield, 30West; and Jamal Watson, Overbrook Entertainment. Sarah Seulki Oh is an independent producer who has made over a dozen short films in Germany, India, Italy, Korea, Turkey, U.K., and the United States. She recently produced her first feature which is currently in post-production. Sarah’s films have shown at prestigious film festivals worldwide including Telluride Film Festival, Palm Springs International ShortFest, and Warsaw Film Festival, and have been supported by HBO, Alfred P. Sloan Foundation, Tribeca Film Institute, ESPN, Film London and the BFI Network. She is a graduate of the Creative Producing MFA program at Columbia University, New York where she was awarded the 2015 Entertainment Partners Best Producer Award. Makena Buchanan is a Texas native and a producer of fiction and nonfiction films. He was a producing fellow as part of the inaugural Southern Producers Lab in 2018. Projects that Makena has helmed have received support from the Sundance Documentary Fund, the City of Austin, and the Venice Biennale. Much like his personal interests, his filmography as a producer predominantly drifts toward two specific pools: the genre films Soft Matter, Close to You,and Slow Creep(Fantastic Fest) and the formally experimental fiction and non-fiction works Las Nubes (Rotterdam, True/False, Full Frame), La espera(SXSW), and Caballerango. Jamie Gonçalves is a Brasilian-American producer based in central Missouri. His body of work as a producer has received critical praise from The New York Times, The Village Voice, Los Angeles Times and Reverse Shot and support from Sundance Institute, Venice Biennale, and Points North Institute. Filmmaker Magazine named him one of the 25 New Faces of Independent Film in 2015, and he served as a programming associate at the True/False Film Fest for five years. His list of productions include Killing Them Safely (IFC Films, 2015 Tribeca), Balloonfest (Oscilloscope, Topic, 2017 Vimeo’s runner-up best documentary short), The Water Slide (2018 BAMcinemaFest, Sheffield), Las Nubes (2017 IFFR, Habana), an upcoming trilogy for Field of Vision, and multiple feature length works by Juan Pablo González, Ilana Coleman, Kamau Bilal, Edwin Martinez and Nick Berardini. Huriyyah Muhammad is a writer, director and producer whose passion lives at the intersection of telling great stories and helping others to do the same. As a producer, she has led the production of multiple independent films, with projects that have been been invited to the Tribeca Film Institute, New Voices in Black Cinema, the American Black Film Festival and been awarded the competitive Jerome Foundation Grant. An equity/inclusion advocate, she is co-founder of the Black TV & Film Collective, a growing NYC based 501c3 with over 1200 members. Huriyyah holds an MBA from NYU, specializing in entrepreneurship and entertainment, and BS in Computer Science from Spelman College. Michael Mobley is a producer based in Austin, TX. He produced Craig Elrod’s latest feature film Mustang Island (Dallas International Film Festival Special Jury Award 2017; recently acquired by Netflix), as well as I’ve Got Issues, the forthcoming full-length comedy from writer/director Steve Collins (Gretchen, You Hurt My Feelings). In addition, he’s produced multiple short films including Elrod’s award-winning short, Molly (SXSW 2014). Other credits include the feature films Rose, Lazer Team 2, and the infamous re-shoot of the Raidersairplane scene, as seen in Raiders: The Story of the Greatest Fan Film Ever Made. Traci Carlson is an Executive Producer at Neighborhood Watch. She has produced films and commercials all over the world. Her latest film, the critically acclaimed Menashe (Sundance 2017), sold to A24 and has been released theatrically worldwide. Other feature and short credits include: Super Dark Times (Rotterdam 2017), Hits (Sundance 2014), Rubber Heart (Sundance 2017) and Hip Hip Hooray (SXSW 2016). She is a Film Independent Producing Fellow and 2018 Indie Spirit Nominee. Alice Henty is a British transplant based in New York. She has worked with many of the leading producers and directors in the field for over 20 years but started producing relatively recently. She Line Produced, among many others, big hitting award winners such as One Day in September, The Tillman Story and Buck, and she Co-produced Beware of Mr. Baker and Skyladder before cementing her position as lead Producer with last year’s The Work. Heralded as a masterpiece in verite cinema The Work garnered deep and wide critical acclaim as well as the Grand Jury prize at SXSW, the Audience Award at Sheffield and various prestigious nominations. She is bringing two projects that she is Producing [with two different teams] to the Creative Producing Lab and Summit. Amilca Palmer is a New York-based producer and researcher. She has worked on numerous critically acclaimed documentaries, including the Emmy Award-winning film The Murder of Emmett Till and the Peabody Award-winning LENNONYC. Her other credits include Koch, African American Lives with Henry Louis Gates, Jr., and the 2015 Emmy-nominated feature The Great Invisible. Mara Adina is an independent creative producer and founder of Vernon Films. She started her career as a producer in the Middle East. Upon her return to the UK she produced Counterpart, the first English-language film directed by two-time BAFTA- winning director and Golden Bear nominee Adrian Sitaru which opened at Clermont Ferrand International Film Festival 2014 and has secured distribution in Europe, UK, and North America. Adina recently produced Ilinca Calugareanu’s debut feature film Chuck Norris vs Communism which premiered in competition at Sundance 2015. Chuck Norris vs Communism is an HBO Europe, ARTE co production, presented by RatPac Documentary films and Impact Partners produced in association with Passion Pictures. She recently became a Sundance Creative Producing Summit fellow and is currently producing Ilinca’s second feature A Cops and Robbers Story as well as a slate of scripted and non scripted films. Violet Feng is an Emmy Award winning documentary film producer. Feng produced Maine-Land (2017), which received Special Jury Award of SXSW and a theatrical release in the U.S.; Please Remember Me(2015), which premiered at 2015 IDFA Film Festival and received three awards at China’s biggest documentary film festival GZDoc in 2016. She executive produced 24th Street (2017), nominated for Best Documentary at IDFA. She is the co-producer of Nanking (2007), winner of Peabody Award and a Sundance Grand Jury Award. Gabriel Sedgwick hails from Sweden but lives in New York City, where he has produced both fiction and documentary films that have screened at festivals such as SXSW, New Directors/New Films, BAMcinemaFest, Rotterdam Int’l Film Festival, Urbanworld, Sheffield Doc/Fest, BAM’s New Voices in Black Cinema, and Karlovy Vary, including Penny Lane’s The Pain of Others and Lanre Olabisi’s fiction features August the First and Somewhere in the Middle. He also co-produced Jeremiah Zagar’s Captivated - The Trials of Pamela Smart for HBO and Sky Atlantic, which premiered at Sundance 2014, and line produced Sara Jordenö’s KIKI, which premiered at Sundance 2016. When not making movies, he occasionally makes assorted noises in the band Odd Rumblings. 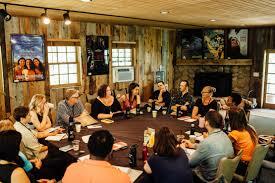 The Sundance Institute Creative Producing Program is supported by Amazon Studios, Cinereach, the National Endowment for the Arts, the John S. and James L. Knight Foundation, and SAGindie. The Sundance Institute Documentary Film Program is made possible by founding support from Open Society Foundations. Generous additional support is provided by Ford Foundation; John D. and Catherine T. MacArthur Foundation; The Kendeda Fund; The Charles Engelhard Foundation; Skoll Foundation; A&E IndieFilms; National Geographic; Science Sandbox | Simons Foundation; Genuine Article Pictures; CNN Films; Discovery Channel; Bertha Foundation; Cinereach; Time Warner Foundation; John S. and James L. Knight Foundation; Compton Foundation; Sundance Now; Nion McEvoy & Leslie Berriman; Vulcan Productions; Joan and Lewis Platt Foundation; PBS; WNET New York Public Media; and Adobe. The Sundance Institute Feature Film Program is supported by The Annenberg Foundation; Alfred P. Sloan Foundation; YouTube; RT Features; Will and Jada Smith Family Foundation; Time Warner Foundation; Universal Filmed Entertainment Group; Amazon Studios; Hollywood Foreign Press Association; National Endowment for the Arts; Sandra and Malcolm Berman Charitable Foundation; The Ray and Dagmar Dolby Family Fund; NHK Enterprises, Inc.; John S. and James L. Knight Foundation; SAGindie; Grazka Taylor; Rena Dillon Cruz and Rene Simon Cruz; Philip Fung - A3 Foundation; Directors Guild of America; and Writers Guild of America, West. Founded in 1981 by Robert Redford, Sundance Institute is a nonprofit organization that provides and preserves the space for artists in film, theatre, and new media to create and thrive. The Institute’s signature Labs, granting, and mentorship programs, dedicated to developing new work, take place throughout the year in the U.S. and internationally. The Sundance Film Festival and other public programs connect audiences to artists in igniting new ideas, discovering original voices, and building a community dedicated to independent storytelling. Sundance Institute has supported such projects as Mudbound, Get Out, The Big Sick, Strong Island, Blackfish, Top of the Lake, Winter’s Bone, The Wolfpack, Dear White People, Trapped, Brooklyn, Little Miss Sunshine, 20 Feet From Stardom, Beasts of the Southern Wild, Fruitvale Station, Spring Awakening, A Gentleman’s Guide to Love and Murderand Fun Home.